Dhaka: Amid student protests, Bangladeshi Prime Minister Sheikh Hasina on Wednesday announced she will be abolishing the quota system for government jobs. Students and job-seekers have been demonstrating on the streets demanding reforms to the quota system that entered the fourth day on Wednesday and brought key roads in Dhaka to a standstill, bdnews24.com reported. "The quota system will be abolished," Hasina said while addressing Parliament in the afternoon when thousands of students blocked many major roads in parts of capital Dhaka. Hasina said the protests were "irrational" after the government had already made assurances regarding the demonstrators' demands. She questioned the rationale of the students and job-seekers continuing with the demonstrations even though the government promised to examine the quota system and give a decision in the wake of their demands. The Prime Minister also condemned the attack on the Dhaka University Vice-Chancellor's residence and said those who masterminded and perpetrated the assault would be punished accordingly. "We must have justice for this vandalism and looting. We will find out those who were involved and the students must help us do so," she said. 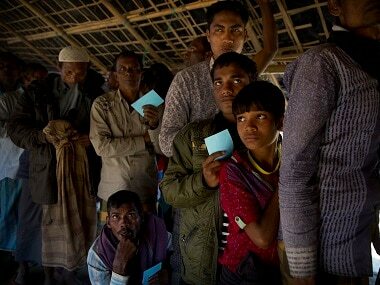 In line with the Bangladeshi government's existing quota system, 56 percent of jobs in the public sector are reserved for children of freedom fighters, women, ethnic minorities, people with disabilities and citizens of some backward districts, a quota which protesters want to be reduced to 10 percent. "We believe this is injustice. These special groups represent only two percent of the population while the remaining 98 percent of people fight for 44 percent of jobs," said student leader Nayeem Khan. Khan added that while the main demand of the students was that only 10 percent of the jobs be reserved for disadvantaged groups, they also wanted there to be similar passing marks for all job applicants and that an applicant not be given the privilege of a quota more than once. The protests began on Sunday when hundreds of students came out on the streets of Dhaka and the police responded with rubber bullets and tear gas, leaving close to a hundred people injured, according to police.